What do the above values say about the development of MO's user community? I think some of the difference is do to questions now being only 5 points. Also with MSE and stricter interpretation of research level, questions have become more technical which means there are fewer questions I can answer and when I do answer a question there are fewer people following the question to upvote it. I believe that my own accumulation of points follows a similar pattern of decline as the overall site. Here is a more complete data set obtained by this modified query. Update: Some more data regarding the development of points gained. "50th" and "100th" mean the points made in that quarter by user with 50th and 100th most points; I include the ongoing one 3/13 which is not quite completed yet but fairly close. The last column count the number of (non CW) questions and answers with positive score that quarter (via this query). Roughly looking at the data it seems quite clear that earlier on users got more points over given periods of time (as suggested by some). Though the trend seems to have stabilized or even somewhat turned around. The significant drop from 2/11 to 3/11 seems interesting. Minor additional update: points gained by 15th user in quarter (reverse chronological order): 1595, 1685, 1770, 1906, 1682, 1702, 1897, 1783, 1960, 1601, 2168, 2385, 2702, 2679, 2985, 2898, 2482. I agree that the main two effects should be the ones mentioned by Gerry Myerson and Scott Morrison. For 2013 there are 84 that already got 2000+ during the year and 21 that got 4000+. So there is a quite significant decline of people that got 2500+ a year from 2010 to 2012 but preliminary data for 2013 suggests this trend does not continue for 2013 (though due to joining network it is a special year). And this decline while for people on the site since a while their back-catalog of questions generates some 'free' revenue of points in subsequent years. I also think there is quite a bit to the idea Scott Morrison proposed. The total number of people that are able and willing to be sufficiently involved with MO to get 2500+ points a year might in the end not be that large. In addition, the data given in OP might be slightly skewed for the following reason. I am in the first mentioned group, which is techincally true as I created the account beginning september 2010 and also posted something, but I actually then did hardly actively use the site for months after that and became really active only beginning 2011, which in practice rather would put me in the second group. Has the effect of multiple accounts been considered? Or is it enough to measure just accounts and assume that they roughly correspond to one account per (synonym for user of account)? I think that such statistics have little meaning. It would be better to look at a filtered view of votes cast per day as well as the number of sources/sinks so that one could see how "easy" it is to gain/lose reputation. The only way to get data on the population is to use personal data that is unlikely to be available. Not the answer you're looking for? 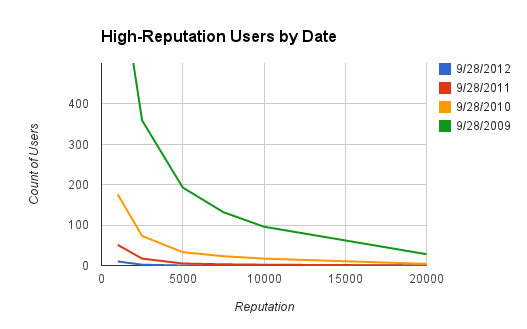 Browse other questions tagged discussion reputation user-accounts statistics .